Throughout my journey in combating Rheumatoid Arthritis (RA), I’ve read, used and tried a lot of programs, supplements and modalities. Some are useful in helping me with my battle with RA, some are completely useless. It is my hope to share with you those that I find to be working for me well so that you too can make use of these to treat your RA condition. This page serves to be a living document, meaning that I will constantly update this page to reflect on new things that I’ve tried that work for me. Do bookmark this page, or save the URL of this page somewhere convenient, so that you can easily and constantly refer back to this page for more information on an on-going basis. Please do forward this page to those that you know will benefit from the information being shared here, so that they can also improve their health and RA conditions. I will also include resources that other people have used to help with their RA conditions as well so that we can all have a wider view of what is available and possible out there for all of us. If you have resources to share, please contact me on this page here. 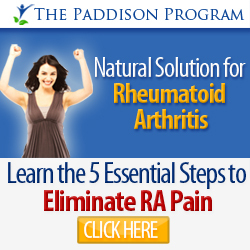 Paddison Program For Rheumatoid Arthritis – The Paddison treatment program for RA using natural healing modalities. Leaky Gut Cure Program – A program that naturally and permanently stop your chronic symptoms at the source, your leaky gut. Yeast Infection No More Program – Clinically proven 5-step candida yeast infection holistic healing system.